"Byte was selected as one of our 3 ‘Innovation Award Winners’ at ScieneLogic’s 2017 client ‘Symposium’ as their integration with their VDI Service, used many different part of the ScienceLogic Platform, that they extended and customised, to solve a very real business problem they faced with their end customers. Of the 180 customers who attended the Symposium, 35 customers participated in the ‘Innovation Award Nominations’ and Byte IT were ultimately one of three customers globally, that were presented with an award." Jeremy Sherwood, VP Product Management at ScienceLogic. Byte has recognised that today’s customers have complex technological environments which require innovative approach and agile services. Staying ahead of curve in an oversaturated market it’s not only about developing the latest technology solutions, it’s equally important how accessible and how empowering the solutions are to the business owners. Today, customers expect a holistic approach and proactive management. Merely providing managed services as monitoring and reacting at the component level equates to poor service. In response, Byte incorporated a preventative service model and integrative solution into its OneSpace environment. In doing so, Byte is able to proactively identify and assess risks, mitigating them before they become problems. A team of engineers built upon the capabilities of the ScienceLogic platform to optimise monitoring and management, and to simplify customers’ IT infrastructure. By identifying and assessing potential risks, customers no longer require an expensive team of in-house experts, downtime is reduced allowing them to focus on their business success. 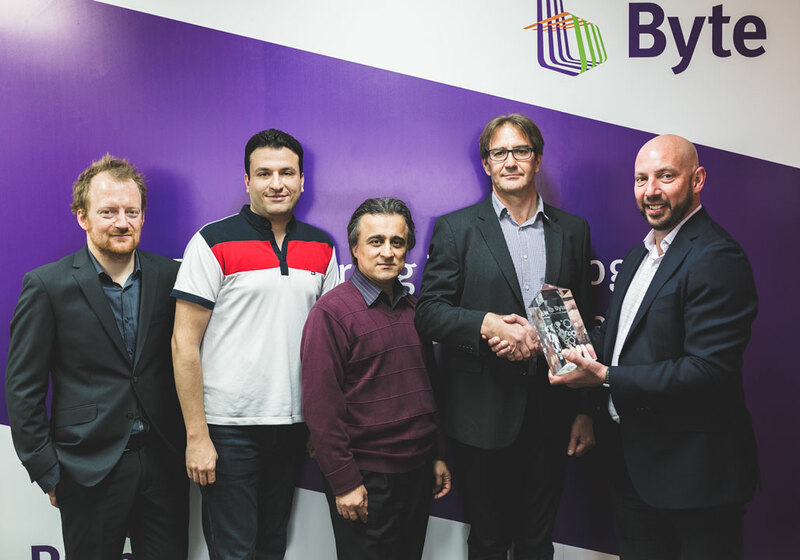 “Byte is demonstrating substantial value to its customers through increased visibility via custom dashboards, custom monitoring solutions and IT service monitoring with business focused metrics favouring Health, Availability and Risk rather than purely technical ones such as memory utilisation and bandwidth usage in our OneSpace environment.”, said David Graupner, Head of Managed Services. The ScienceLogic Award judges were particularly impressed by the progressive and innovative approach taken by Byte. “This is a big win for Byte. We worked really hard to utilise the full potential of the platform. Even though we are using it for 4 months only, we managed to build very useful tool and we took the monitoring capability to the next level. Byte is more effective today, and services it’s client far better, because we see the status, health, and risk levels of their IT environment”, said Bob Ahmadi, Tools and Automation Lead. This change in focus and value proposition has empowered customers, allowing them to grow their business, instead of worrying about IT. “We are honoured to be recognised as one of the innovators in the industry. This is an industry that is evolving fast due to customer expectations around holistic view of their (complex) environment and what it means to the end user experience as well as business benefits. We are no longer in the business of showing dials and traffic lights – we partner with our customers to optimise the operation of their technology services with response time and availability for users and balance between risk and cost to business”, said The Byte Founder, Robert Roshan.